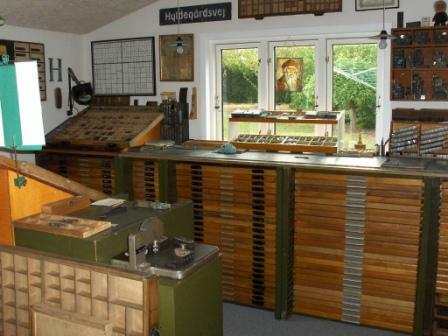 The Workshop has a well equipped composing room with more than 200 cases of wood, Monotype and foundry types, an A2 flatbed press from J.G.A. Eickhoff, Copenhagen 1963, an A5 table top platen from A. Hogenforst, Leipzig appro. 1880 & an Adana 8x5. As a special recourse to the Workshop, there is a large collection of Type Specimens, periodicals and books relating to the history of letterpress printing, typography, type design and casting of printing types.